The African proverb, “The spirit will not descend without song,” is intrinsically intertwined within the African- American religious experience, and is a revered aphorism encompassing the music of Black America, in its many forms and variations. 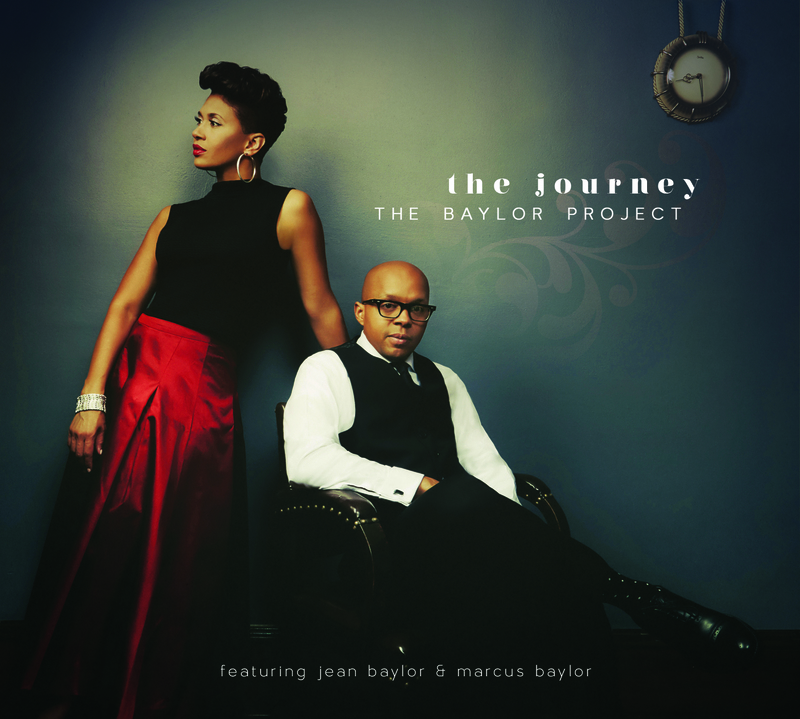 Jean (vocalist) and Marcus (drummer) Baylor, known collectively as The Baylor Project, have deep roots in the church, and on The Journey, take a look back to where they came from, drawing deep from hymnology for inspiration, yet maintaining the secular swing and edge so essential in contemporary jazz. The unmistakable sound of a needle dropping on a record opens “Block Party” a rousing, sanctified instrumental accentuated by rigorous hand-clapping and joyous celebration. Organist Shedrick Mitchell takes it to the river, and trumpeter Freddie Hendrix invokes the second line, as the hours between the Saturday night club, and Sunday morning service, appear to fade away. Jean is graced with a polished mezzo-soprano voice, seasoned by years singing hymns as “Great Is Thy Faithfulness,” which is given a delectable jazz arrangement, highlighted by the tenor sax of Bob Mintzer. The soft side of Herbie Hancock is revealed on his ballad “Tell Me A Story,” Jean composing the lyrics, Hendrix reappearing on a flugelhorn solo, as Marcus adds a shimmering cymbal backdrop. “Tenderly,” is performed just as the title suggests, enhanced by Allyn Johnson’s piano accompaniment, leading to the alluring sax of Keith Loftis. The Gershwin songbook is visited with the blues oriented ‘Our Love Is Here to Stay,” Jean exposing her scatting ability, and the memorable “Summertime,” is presented in a sultry bolero tempo. Beginning in hushed tones, enveloped in lush orchestration, “Again” breaks into a sizzling middle section where Marcus establishes a fast lane for stretching out. Jean joins in with spirited improvisation, then leads them back into tranquil waters. “Voice Of The Drum,” is a percussive interlude, a rhythmic introduction to “Afro Blue,” where Jean’s voice floats upon an Afro-Caribbean sensibility, saxophonist Loftis and pianist Johnson adding high energy and drama to the swaying momentum. They proudly show-off their soul music heritage as Jean channels Aretha on “Laugh And Move On,” complete with gospel tinged piano and backing vocals. “Journey,” wraps up the set, and is a montage of vintage preachers praising the Baylor’s talents as children, while Marcus plays in a circular drumming pattern, Jean incanting an ancestral chant. A fitting closure to how The Baylor Project created and conceived this record, encompassing the musical and cultural reflections of their lives, from family to church to a life in jazz. This is an excellent portrait of African-American music, showcasing where it came from, and where it is now. Track Listing: Block Party; Great Is Thy Faithfulness; Tell Me A Story; Tenderly; Our Love Is Here to Stay; Again; Summertime; Voice Of The Drum (Interlude); Afro Blue (Dream); Laugh And Move On; Journey. Personnel: Jean Baylor: vocals, handclaps; Marcus Baylor: drums, Handclaps; Shedrick Mitchell: piano, organ (1, 2, 3, 10); Allyn Johnson: piano (4- 9); David “DJ” Ginyard: electric bass (1, 2); Chris Smith: upright bass (3, 10); Dezron Douglas: upright bass (4, 6-9; Corcoran Holt: upright bass (5); Marvin Sewell: guitar (3, 6-9); Rayfield “Ray Ray” Holloman: guitars (1, 10); Bob Mintzer: tenor saxophone (2); Keith Loftis: tenor saxophone ( 4-6, 8-9); Freddie Hendrix: trumpet, flugelhorn (1, 3); Keyon Harrold: trumpet (6); Stafford Hunter: trombone (6); Aaron Draper: percussion, handclaps (1); Pablo Batista: percussion, handclaps (2-4, 6-11) Nicole Neely: live strings, arrangement ( 6); Brandee Younger: harp (7).